Having already been a guest at MINT’s panel discussion under the title Why It’s Impossible Not to Be Political, Reclaim The Beats curator and Reveller founder Sky Deep took the role of a moderator ta a similar event. How to Bring Politics (Back) to the Dance Floor? 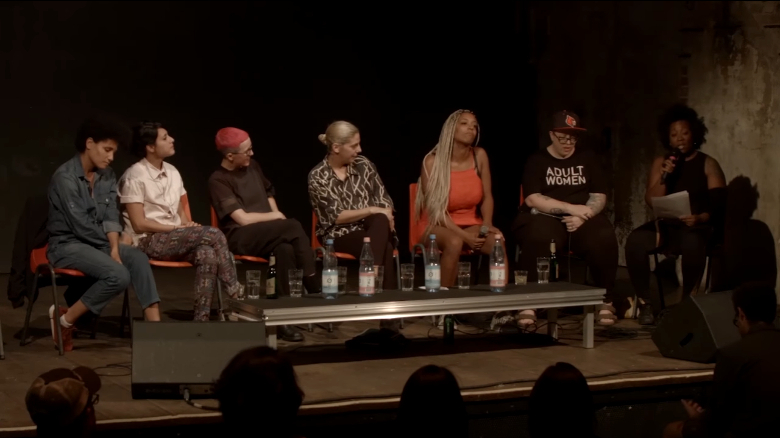 Political Activism in Dance Music Today was co-hosted by the Berlin-based Room 4 Resistance collective – represented here by Luz and rRoxymore – as well as Discwoman, whose co-founder Frankie Hutchinson also took part in the conversation, and SchwuZ’s regular event series Hot Topic. Other guests included Avril Ceballos of Cómeme and futura, SchwuZ booker LCavaliero Mann and The Black Madonna. The discussion however does not end here: Along with a broad programme from film screenings to club nights, Reclaim The Beats will host another panel discussion which promises to pick up where the MINT night in early June left off: The Artist’s Role in Society #2 – Creating and Re-Creating will take palce at Kreuzberg’s Maze on September 15, the last weekend of Reclaim The Beats. Room 4 Resistance meanwhile will bring their activisim directly to the dance floor, hosting a party at ://about:blank on September 10. See the whole panel discussion below!